This site has seen some decent (indecent comments removed) discussions on various subjects of importance to all from Belgaum, Belgavi to cutting of trees. The most significant problem Belgaumites are facing for all these years and to which no authority is looking to correct it is the Auto fares in Belgaum. For the past three days Autos are off the road and they are holding the regular commuters to ransom for no wrong done by them. The autos are off the roads on the demand that the police should find the culprits behind the murder of their fellow driver Noor who was killed latter part of the week. Even on Friday the whole city there was tension on this issue, where as the police say that the murder was due to family matters and some people tried to give it a communal touch. My question to all, why is that in Belgaum over so many years and so many great IAS and IPS officers in town no one could start the Autos by Fare meter prescribed by the government. Is it that Belgaum does not adhere to any laws of the land? Only the people sitting as MP’s MLAs can answer this, as no one has tried to solve this most common and most important issue, which if solved can help all Belgaumites. How many know the exact minimum auto fare? Take a guess! No one !! the minimum auto fare for Belgaum city is Rs.12 for 2 kms and then Rs.6 per kilo meter. I need one person who has traveled by paying Rs.12 the minimum fare. The minimum fare charged is Rs.15 straight forward. Refusal to come near by, excess fare and rude behavior for which auto drivers can be punished under law is the daily practice by them,as there is “NO MAIKALAL” who will ask them. Earlier attempts were made to impose auto by fare meters but the Auto drivers resented to it and the same could not be achieved. 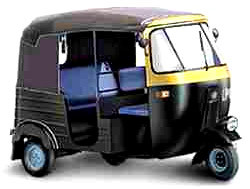 The auto fare in Bangalore is Rs. 14 per 2 kms and then Rs.7 per km. In Mumbai the minium is Rs.9 per 1.5 km. If by mistake any of the authorities responsible for this is reading this please try and travel by autos and see how horrible it is. Most meters on the autos never work (except on the day at the RTO for passing) many don’t have one as well. The police never try and stop and ask for a license of an auto driver, especially those running auto at night, who are young kids with no license. The pre-paid auto at the railway station is also not working in a good manner due to the wrong intentions of the auto drivers. If there is a law why is not applicable to you in Belgaum? Are these auto drivers not bound by law? 7. Maximum passenger Luggage to be carried is – 50Kgs. Fare at Night- One and half times of prescribed fare to be charged from 10.00 pm to 5.00 am. And is there any “MAIKALAL” who will take this mater to conclusion. The Minimum fare for Taxi in Mumbai is Rs.15/- even when u have loads of luggages. In Belgaum we have to travel by Auto and tell the auto Driver Chalao auto aur araam sey auto-fare mein Looto"
How long ago these fares were fixed? Because, I am not sure if recent increases in fuel costs were taken into consideration. Even if fuel prices were taken into account, auto drivers charge outrageous amounts for small distances. Ex. Pick up at Ramdev hotel and dropoff at Azam Nagar costs upwards of Rs. 60 between 4am and 6am when you arrive from Pune or Mumbai or Bangalore tourist buses. Is that fair? During day time Azam Nagar to Tilakwadi costs Rs. 80. Auto owners also take advantage of irregular and disconnected service from state road transport corp. Residents are helpless and ready to pay when they need an auto. The auto owners association office bearers should be held accountable, who join with corrupt RTO officers are letting such things go unexplained. I believe that all the comments which appear here have to be approved by you or your appointed moderator. I still don’t understand why and how you approve such comments. I don’t know about your feelings, But I would like to say that, if such comments continue on your site, there will be very few people peeping on here. We are hurt to read the comments passed by such PERVERTS who know just to fight on the name of Religion, language, Borders. They are anti human. Please just ignore such people. I know it may be hard for you, But they are not worth a single cent of attention. It is horrible to travel in auto at Belgaum. Today, I came from Bijapur. At the outset, autowalla demanded Rs.60/- to drop me at my res near Cngress well. Finally, I went out of Bus Stand, stood on the road and got a drop at Rs.35/- by an auto. Auto drivers at Bus Stand and RS demand any thing that comes to their mind ! No law applies to them. No DC or SP has ever bothered to control them. Misbehaving with passengers is common. They speak in Kannada with Marathi speaking passengers and visa versa and trouble the passenger/s. Let us hope Ms Naraga, IPS will look into the matter and bring the errand auto drivers to book and auto tavel a decent travel at Belgaum. Its not possible for single aam adami to riase voice against all auto drivers to protest this.bieng out of home town Belagaavi one cannot expect his old parents to fight such issues in Belagaavi, we must be unite,lets plan MORCHA or Protest against this,who all will join hands with me to visit DC office and present a memorandum against AUTO LOOT ? Uday please create a pole or Vote bank in this page for this ,we can gather as many people as possible and we can place forward a request to DC or SP. @ Mahant, Please , its Belgaum. Dont take the oppurtunity and try to instigate any reader here. @Uday, Beware of such people, Very soon the same will plan a morcha at your doorstep to change the name of this website to belagaavi ! When u cant do anything atleast dont pull down who want to do something for society…..
"Tu naa Khud sudarega ya na Duniya ko sudaarega….. "
Sawant, are you out of your mind? Where does the question of instigation come here? Mahant is giving a very constructive and valid suggestion to fight the menace, and your are talking nonsense. Are you a autowala yourself, or one of their agents/representatives ? Khud to kuch nahi karenge, jo kuch karna chahte ho unki raah mein bhi roda atkaayenge. Nice to see your article like this here, But is it suppose to end up as an article only? how can we proceed further ? how can we raise the voice against this? When a trouble occurs in Bengalooru like cutting the trees at Lalbhag for metro construction, thousands of software employees came on road on weekends to protest against this, n finaly govt dropped its plan,but who is there in Belagaavi rise voice against these issues? Are our so called parties like KRV n MES are only meant for creating voilenece ?they dont want to protest against such issues?where are educated people of Belagaavi hiding ? Well written Uday. Autowalas are looting belgaumites virtually. Deputy Commissioner for Transport, Belgaum Division, R.T.O. Office Compound, Shivajinagar, Belgaum.